The United Kingdom has transparency laws which should give citizens a full and immediate answer to this question. And yet, we still don’t have one. 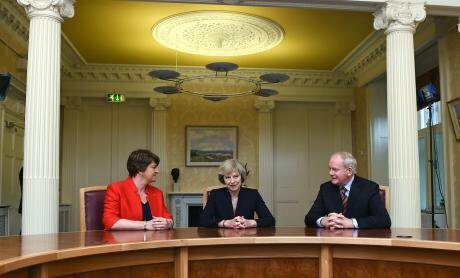 Theresa May with Arlene Foster and Martin McGuinness at Stormont Castle in Belfast, as she said that the UK's departure from the European Union must work for Northern Ireland. Charles McQuillan/PA Images. All rights reserved. This week openDemocracy will reveal worrying new details about the ‘dark money’ that bankrolled Brexit – and the loopholes that still allow secret donors to push their political agendas in the UK without public knowledge. For the next four days, we will be publishing a new story daily which adds to this disturbing picture. We start today with the latest results of Adam Ramsay and Peter Geoghegan’s investigation into the mystery source of a £435,000 donation to Theresa May’s allies, Northern Ireland’s Democratic Unionist Party (DUP), which was spent on lavish pro-Leave campaigning in the weeks before the EU referendum. The DUP now props up Theresa May’s minority government in parliament and the £435,000 – a much larger sum than the DUP has ever spent on an electoral campaign in its history – attracted particular controversy because almost none of the cash was spent in Northern Ireland. Yet the donor secrecy laws which apply to Northern Ireland, and not the rest of the UK, mean that citizens aren't allowed to know who gave all this cash. Adam Ramsay and Peter Geoghegan have been tirelessly following this story, which took a bizarre twist a few months ago when Channel 4 News doorstepped Richard Cook, chair of the secretive group that channelled the money to the DUP (watch it here). Our investigations also led us to discover last month that MPs in Theresa May’s Tory party are using taxpayers cash (via their expense claims) to fund a hard-Brexit lobby group operating inside parliament. Crucial to maintaining the fabric of democracy is understanding where large donors have made their money, and more importantly, how. May’s government has now announced it will end donor secrecy in Northern Ireland, but has rejected calls to backdate the law to 2014, so that the source of the DUP donation could be revealed. Government and DUP sources have denied that this is ‘protection’ for the DUP, as part of their £1 billion deal to keep the Conservatives in power. Expect more from openDemocracy on the DUP’s secret donors – as well as on other sources of Brexit campaign funding – in the days ahead. Many of those in the UK and across the world who don’t want Brexit to happen might be tempted to cite our stories this week as more evidence that the referendum result was dodgy or illegitimate. By the same token, many of those who do want Brexit will brush off these same stories, because they don’t want to see the result undermined. We would only ask that anyone on either side judges these stories on their own merits, and thinks more broadly about the questions of transparency they raise. openDemocracy, as always, gave space to many different perspectives during the EU referendum campaign – from our former UK editor Oliver Huitson’s reasons for voting Leave, to the Green Party’s MP Caroline Lucas on why remaining in the EU is essential to protecting the environment. We also widened the perspective beyond our shores, bringing in European perspectives to a depressingly parochial national debate. Since the referendum, we have hosted the full spectrum of voices, stretching from the key Brexit architect, Education Secretary Michael Gove, to hip-hop artist Akala on the racist roots of the Brexit impulse. openDemocracy’s founder, Anthony Barnett, has written an excellent book which busts myths and complacency on all sides. And we continue to robustly question and challenge the powers that are shaping Brexit. So, as ever, we are asking you to make up your own mind. What we feel strongly about, however, is that the UK’s current transparency laws, and their policing, seem alarmingly inadequate. openDemocracy (working with WhatDoTheyKnow) recently published a tranche of emails which underlined some of the most extraordinary details about the Brexit campaign. Not least that Vote Leave gave a student, Darren Grimes, with no previous campaigning experience, £675,000 overnight, paying bills directly to the controversial data firm AggregateIQ on his behalf – yet “the [Electoral] Commission decided to take the matter no further as there was ‘no reasonable grounds’ to believe that Vote Leave and Grimes had been working together”. In short, there are far too many loopholes for those with secret agendas to hide in. The donor anonymity laws used to funnel Brexit cash to Theresa May’s allies, the DUP, are just one route. See also Adam Ramsay on the ‘dark money’ driving the Scottish Tory surge, and Carole Cadwalladr’s excellent work on big data and dark money in the Guardian. There is also far too little resource being spent on investigating these pressing issues – from the under-funded Electoral Commission to the few journalists who are making it their business to find out more. Stories in Buzzfeed, Private Eye, and a Financial Times investigation into the overlapping businesses of ‘King’ Arron Banks have helped shed light on some of the questions that need to be asked. But the resource is paltry compared to the scale of the task. Stay tuned – @openDemocracy will be tweeting each story under the hashtag #BrexitDarkMoney and each new story will appear daily on our front page. And if you think our work is important and want to see it continue, please support it below. Thank you. Read: Day 2 - 'Substantial' fine linked to DUP's secret Brexit donors. And day 4 - How did Arron Banks afford Brexit?